Microbiology, What is it good for? Micro-organisms may be tiny, but the science of microbiology is immense and it's implications are spread throughout a range of sectors. To a lot of the first year medical students, Microbiology is often seen as one of those subjects you just have to get through and only a few display any real interest. At the basic level microbiology can be seen as the science of organisms not perceivable by the human eye alone. Roughly speaking if the organism of interest has a diameter less than 1mm it's best to whip out that microscope so the specimen can actually be observed in detail. Microbiology has had a rich history, and has made many advances in fields inside and outside medicine. The following short film by RevMen highlights some of the great moments in microbiology. Directly in the health arena microbiology is important for understanding a range of diseases and their pathogenesis. On a more system-wide level it has lead to public health measures (e.g. sanitation, clean water) and more recently infection control procedures within hospitals. 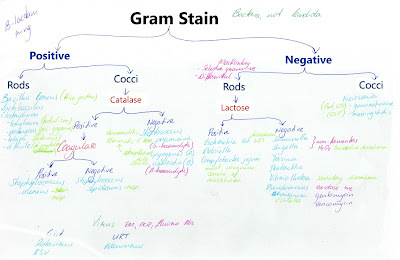 The Gram Stain is a common microbiological procedure used to identify micro-organisms. 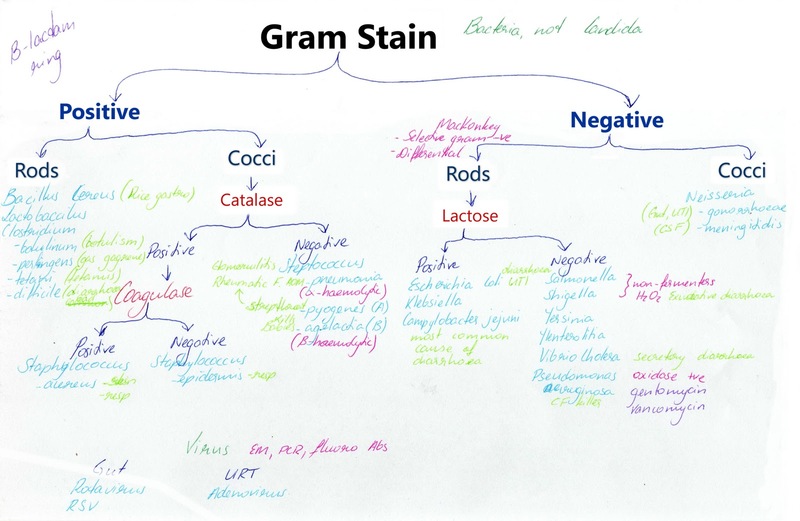 Not all micro-organisms can be identified by gram stain, however it is a useful first-line test, usually taking less than 4mins. The table below highlights some characteristics of gram positive and gram negative bacteria. Below is a summary for health students of some common micro-organisms and how they are identified. In short, whilst microbiology might not always seem like the most fun, it has had a robust history and still plays a vital role in the medical world today.